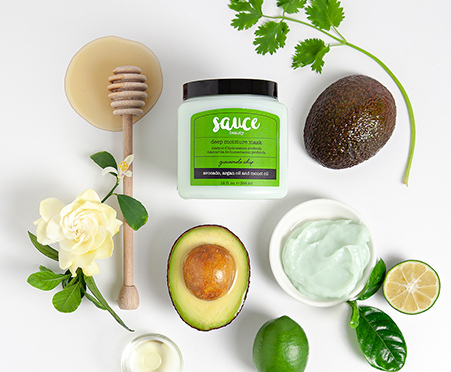 Your hair will thank you for this whipped, rich Guacamole Whip; infused with the power of avocado, Jarrah honey, argan oil, and monoi oil. Double dip all you want, nobody’s looking! Use after shampooing or conditioning. Work through damp hair, from roots to tips. Leave on for 3-5 minutes. Rinse hair thoroughly. Use 2-3 times per week. Sauce is meant for your hair, so please don't eat! Water (Aqua/Eau): Every part of your body, including your hair and scalp need water to survive. Remember, your body is made up of 60% water! Glycerin: Glycerin is an effective moisturizer for the hair and helps define curls and minimize frizz. Honey: Honey is a humectant which leaves skin moisturized and smooth. 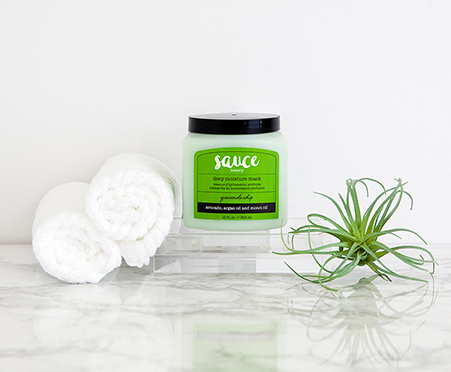 Avocado Oil: Loaded with protein, essential fatty acids, and vitamins, it helps moisturize and repair dry hair. Argan Kernel Oil: Loaded with fatty acids and vitamin E, argan oil makes hair softer, shinier, and silkier. Gardenia Tahitensis Flower Extract: Neutralizes the negative charges on your hair that cause static, so your hair can stay frizz-free! Coconut Oil: Coconut oil is rich in fatty acids, anti-oxidants, and vitamins, and helps prevent breakage. Castor Seed Oil: Castor seed oil is rich with vitamin E and protein, making hair healthier-looking and stronger. It also has anti-bacterial and anti-fungal properties. Tocopheryl Acetate: Contains vitamin E, has anti-oxidant properties, and helps boost the vibrancy and shine of the hair. Click here to see every ingredient in this product and learn about why we included it in our recipe.